Older than the Globe, home to Shakespeare and Marlow, The Rose Playhouse is one of London’s hidden historical gems. Hidden in the literal sense as the foundations of the city’s first Tudor theatre now lie submerged underwater underneath an office block. I discovered it by chance one Saturday while walking down the South Bank. A sign invited me to come and explore. The foundations of the theatre were discovered in 1989 during excavations for an office block. Now, instead of an open air stage like the Globe, the Rose looks up to a concrete sky. It is truly remarkable how it survived all these years – and what it can tell us about our not so distant past. 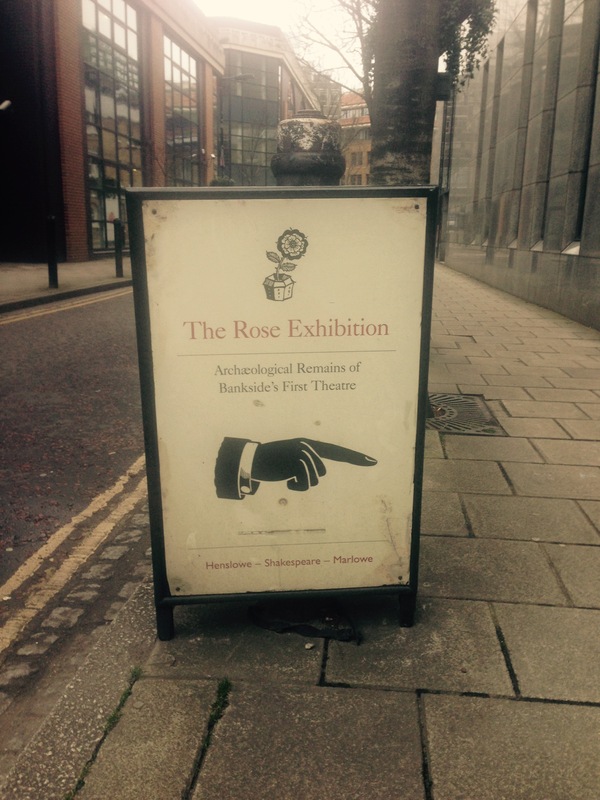 The Rose Playhouse has an open day every Saturday. Go along, meet the volunteers, see a production and immerse yourself in London’s theatrical heritage. Gods and Monsters was first a novel – Father of Frankenstein by Christopher Bram. It became the Oscar winning film starring Ian McKellen and Brendan Fraser and now it has its world premiere as a play at the Southwark Playhouse. The tale of Frankenstein director James Whale’s last few days on earth is sad and unsettling. A once powerful and creative mind is disintegrating fast. Yet despite this the play is also laced with shards of dark humour. Ian Gelder plays James Whale and captures the pride and the lost talent of a man who did everything his own way – a boy who grew up in the slums of Dudley and ended up filming some of the most iconic horror films of the 20th century. But despite a long and illustrious career, Whale knows the monsters he created – Frankenstein’s Monster and Bride of Frankenstein – will outlive the man. Gods and Monsters is set in the 1950s. James Whale is now long forgotten by the studios and lives in virtual retirement. A series of strokes has splintered his mind. Frankenstein director James Whale was openly gay which was very unusual in the 1920s and 1930s. Gardener Clayton Boone (Will Austin) becomes the object of Whale’s disintegrating desire – his last dangerous obsession. As James Whale’s mind unravels, his past sears through to the present. Gods and Monsters is a powerful and affecting exploration of memory, desire and the immortality of art. Bitter Lake, Adam Curtis’ new film, made its debut on Sunday 25tJanuary. The documentary was not broadcast on a terrestrial channel. Instead, it made its debut on iPlayer, thereby making this service a channel in its own right rather than a catch up destination. In many ways, IPlayer is a natural home for Curtis’s unique brand of shape shifting, genre denying documentaries. Nobody else creates television quite like Adam Curtis. He locks himself away for months at a time with piles of tapes and weaves together unsettling narratives. From The Century of the Self (2002) to All Watched Over by Machines of Loving Grace (2011), watching a Curtis film is like seeing a damaged dream. Bitter Lake is made of archive footage from Afghanistan. Putting it on iPlayer allows Curtis the freedom to let his unsettling narrative play out for as long as he feels the story requires rather than how long the channel dictates. It is not easy to watch. There is no straightforward structure. It is not a fight between good and evil, rather an unsettling combination of fact and mood. Because Bitter Lake is in iPlayer, sequences no longer need to be rigorously edited so they follow the style and format of a current affairs programme. Instead they can hold shots for a long time, allowing the observer to slowly become absorbed.It delves beneath the surface. It is not an easy watch but it is hypnotic and strangely beautiful in parts. Now Adam Curtis has led the way, it will be interesting to see how other filmmakers use this new channel. What is it about things that go bump in the night? Today, dark shadows lurking in the corner can be extinguished with the flick of a light switch. However, our collective fascination with the other-wordly shows no sign of abating. This was evidenced by my recent visit to the British Museum’s Gothic Imagination exhibition. The exhibition took me on a suitably supernatural trip through the world of the macabre. This is a place populated with ruined castles, young ladies dressed in white and sublime landscapes where thunderstorms crash through angry purple skies. As a former English Literature student, following the history of the Gothic novel was probably my favourite aspect of the exhibition. The journey began with the pioneers of the form, Horace Walpole and Ann Radcliffe. There was a wonderfully waspish letter from Ann to her mother-in-law. Original manuscripts ranging from Emily Bronte’s Wuthering Heights through to Clive Barker’s first draft of Hellraiser were on display. It was wonderful to be able to follow the creative process involved with these iconic works. Seeing Shelley’s comments on Mary Shelley’s draft of Frankenstein transported me to that now legendary gathering on the shores of Lake Geneva where Byron challenged those present to come up with a ghost story. If vampires were keeping you up at night, the exhibition also included a rather terrifying looking kit for their extermination. This rather gruesome object on loan from the Royal Armouries in Leeds included a stake and silver tipped bullets. It was not said whether it had been used in anger or not. The exhibition is no longer. But in a suitable nod to the everlasting nature of some of the inhabitants of the Gothic world, a podcast lives on.